What are your tattoos? Do you like or dislike them, do you have any future plans to get any? I want a full sleeve in the future. I plan on getting my four dogs paw prints on the back of my arms above my elbows. Also, I want more roses with the vine turning into scripture that quotes a piece of one of my favorite poems. This is when my arm had gone down. I have six so far, and want to be absolutely covered in ink. Gosh the cherry blossom branch is gorgeous!! I'm going to try and stick with the rose theme on my body minus the dogs paw prints and I'm still thinking about that one. I love outrageous colors thought! I did want a cactus at one point due to some song lyrics. 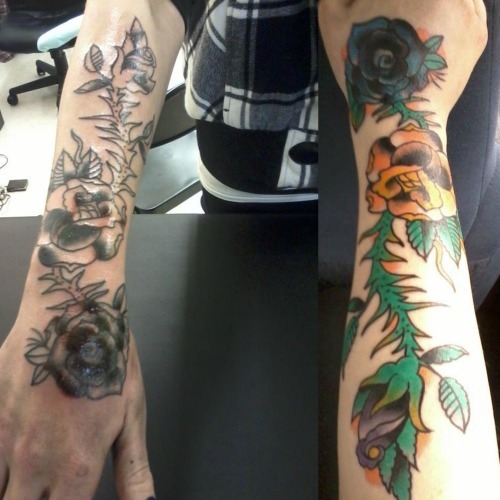 I'm still thinking of how well it would look with the roses. I think it could mesh well though depending on the style. All of mine, except the stars on my ankle and the star gazer, are done by the same guy. The star gazer is done by his apprentice and what I have learned form him is that if you get a good person you are loyal too they really can make all of your ideas flow and go together. That being said I am lucky to find that one artist so soon. I am a super fan of vibrant colors as well. My fiance has a lot of black and white stuff and everything except my script and my stars are colored. Oh yeah I want to stick with the old-school theme. It's just beautiful in my opinion. I'll always go back to the same artist he did a wonderful job in my opinion and he's worked for some really notable people in the tattoo world. ;v; I do realllllly want to see that shark tattoo! I know this is over a year old but I guess I'll be reviving it. I have one of my right shoulder blade. It is a large colorful butterfly that I will probably get recolored one of these years. I I love it and have for years. Most don't even realize it's there because unless I wear a tank top or something you never see it. I really have no plans to get more, I guess at this point I am a one and done sort of girl. I only have two right now. I really want to try to get The Mark of Cain from Supernatural on my right forearm, but I just gotta find time for it Thankfully, money is no issue for me because my step-brother owns a tattoo parlor so I can get my stuff done for free.